The 2018-19 winter season is almost upon us, and it’s expected to be a rough one (we’ve already had a major storm before December!). That being said, as rental property management, there are some exterior fall checklist items you’ll want to make sure you complete (for your tenants) prior to the official start of winter. Inspection: Snow and ice buildup adds extra weight to branches. If trees on your property have weakened limbs or branches, this added weight can lead to damages associated with fallen/broken limbs. Trees within 100 FT of any building are particularly important to inspect, to avoid limbs falling on and damaging buildings/apartments. Winterization: Pruning, mulching, fertilization, watering, apply wilt-pruf, and wrapping boxwoods (to help with deer and frost damage) are good items to complete now, to protect your property’s landscaping in winter. Prevent Frozen Pipes: Frozen pipes can lead to a large and expensive headache for you as the rental property management team/person. Insulting pipes can go a long way in preventing this. If pipes for your buildings are located in colder areas like garages, crawl spaces, or basements, and/or they are running against exterior walls, pipe insulation is particularly important. Clean Gutters: It is part of the responsibilities of the rental property management to make sure that your building’s gutters are working as they should. Gutters are your building’s first line of defense against rain water, and go a long way in protecting your foundation. Winter is tough for your gutters already due to freezing, so if they go into winter clogged, the harshness of the cold can be even more damaging. 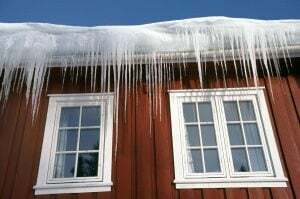 Roof: Similar to tree branches, your roofs are also taking on access weight from snow and ice. Inspecting the roof on all buildings before winter is important to ensure that it can bare this extra weight. 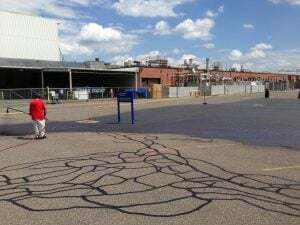 Crack Filling: All cracks in your parking lot should be sealed prior to winter. Winter is extremely harsh on your pavement, and going into winter with existing cracks means the damages associated with winter conditions will be much greater. Sealing cracks helps to eliminate water penetration to the base. 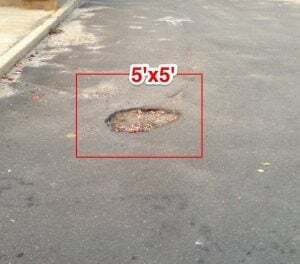 Pothole Patching: Unfortunately, it’s pretty much guaranteed that your lot will have some potholes after winter due to the harshness of the season. But, going into winter with existing potholes can lead to total pavement deterioration, and the potential for damages associated with possible injuries. 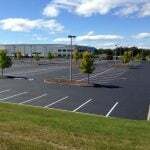 As the rental property management, you can be held liable for these injuries associated with an un-kept parking lot. 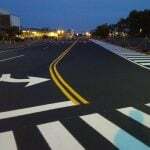 Sealcoating: Asphalt sealer is great for protection, aesthetic appeal, and preservation of your asphalt. It is best when combined in conjunction with crack filler. 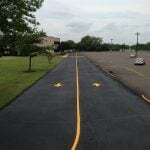 Line Striping: Line striping is a must after sealing your lot, and it is particularly important before winter to ensure visibility for safety in relation to traffic indicators and properly marked spots. Drainage: A correct and properly working drainage system helps to direct water and avoid excess pooling on your pavement. This is particularly important during winter months due to the excess of water from snow melt. 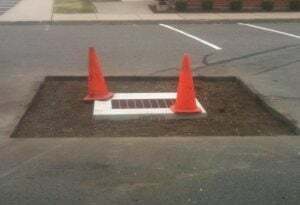 Catch basins should be inspected and repaired in the fall. Winterization: Drain all of the water out of the pipes, turn off the system, and cover spigots. This can help to prevent freezing that leads to bursting. Inspect & Fix: A drafty, inadequately insulated building is costing you money. In many rental situations, the property management company pays for heating oil. This means if a significant amount of heat loss is happening, you’re throwing your money right out the window, literally. Consider reinsulating attics and caulking around drafty windows and doors. Cover: If your tenants have wall units, or if your buildings have central air, covering the outside units is a good idea to protect it from the harsh winter elements. If your renters have window units, you’ll want to double check that they have been removed. When a renter signs an agreement to live within your building, certain responsibilities are placed on you as the rental property management team. This fall checklist includes some important items to complete prior to winter, to not only avoid liability associated with not doing so, but to also save you money, and keep your tenants happy and comfortable. 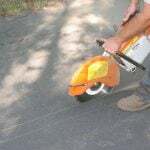 For your winter preparation pavement needs, contact EastCoat Pavement Services for your free consultation. Let us help ensure your lot is prepared for the harsh months ahead.